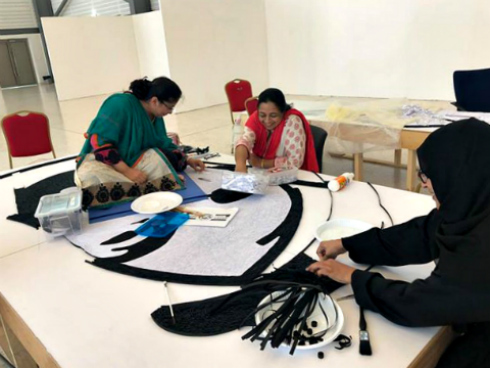 Years ago I was a member of an online quilling group where I met Nandini Acharya Rao who lives in Dubai. The group disbanded eventually, but she and I have always stayed in touch via Facebook. 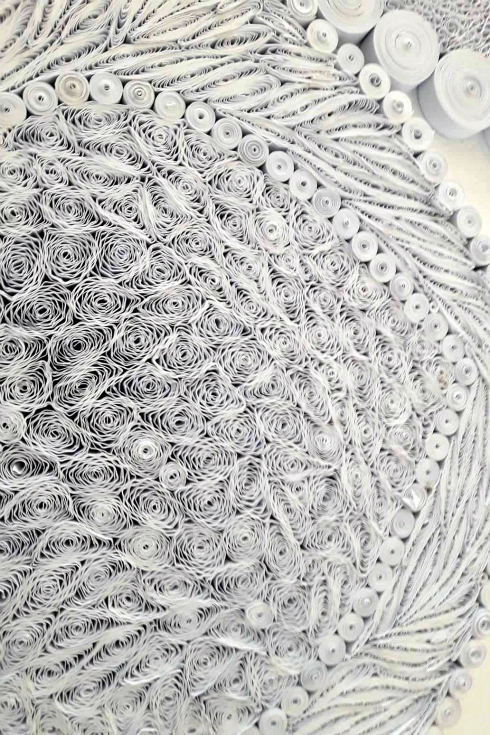 Recently, Nandini posted photos of a huge - no, HUGE - quilling project that she was involved with in recent months. Because I have a hunch you will enjoy hearing about this massive undertaking as much as I did, I asked her to tell us about it. 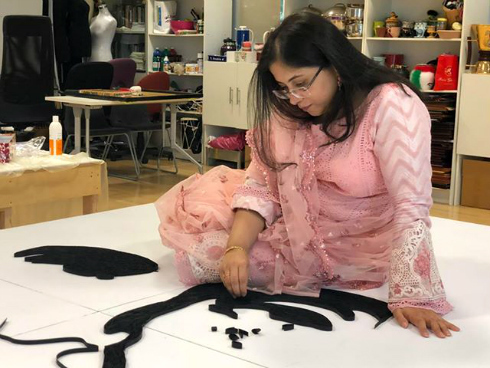 She deferred to her close friend, Yasmin Hagalwadi, who was the project coordinator and had requested Nandini's help in quilling the central portion of the mural. 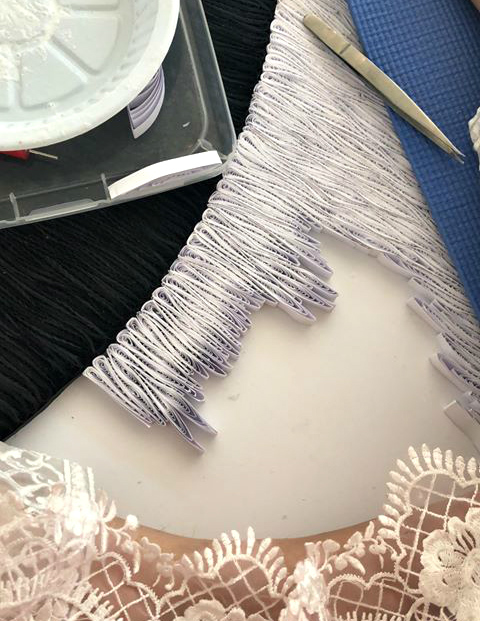 What follows is an interview with Yasmin in which she tells about nearly a year of dreams and hard work, and how the quilled mosaic project came to fruition - enjoy! Yasmin, let's begin with an overview of this grand project. 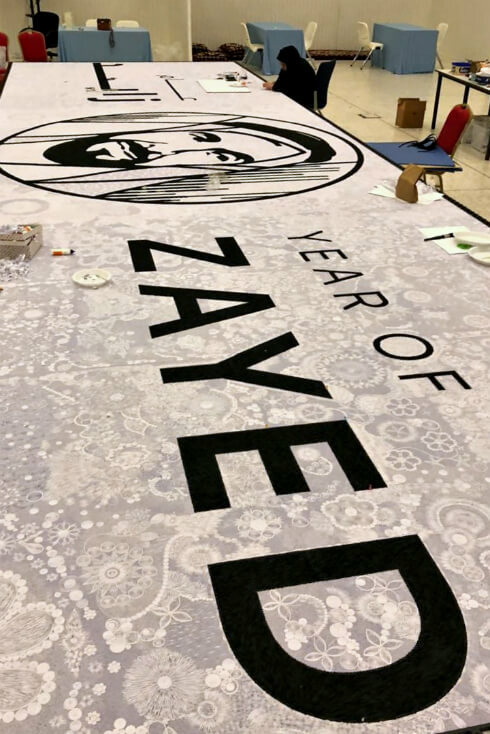 It is a Paper Quilling Mosaic Logo made to celebrate the Year of Zayed, done at UAE University, Al Ain, to pay respect and show love and gratitude to the Father of the Nation, Late H.H. Sheikh Zayed Bin Sultan Al Nahyan. [Wikipedia] Made with the help of volunteers and students from the various fields and colleges of the University, it was a beautiful achievement of many people. This Khaleej Times article includes a short video that conveys the size of the mosaic. 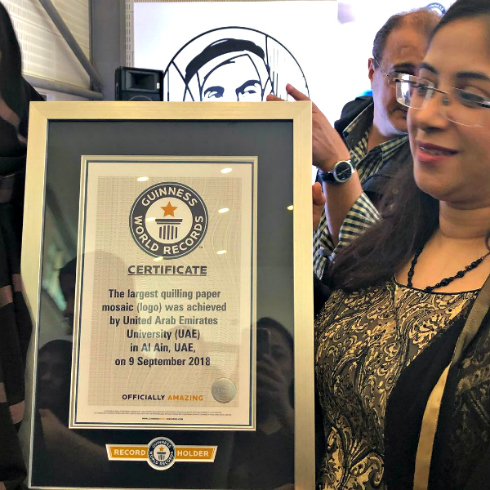 The UAE University Authorities were very happy with a Paper Quilling Exhibition done by my students in November 2017. During this exhibition, the Vice Chancellor of the University wanted us to think about making a Guinness World Record in paper quilling. 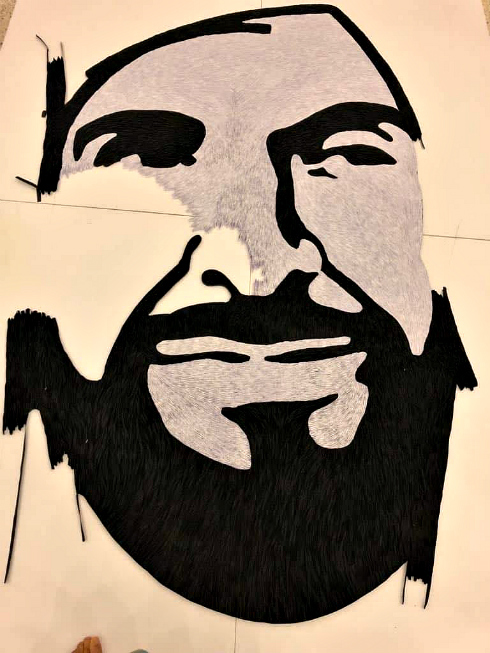 After a lot of brainstorming and discussions, the students activities coordinator and I suggested a quilled logo to show our respects for the Father of the Nation. This logo had just been launched in the UAE and 2018 was marked as the year of Zayed. What challenges did you face with the completion of such a large project? a. The size at 25 sqm was much bigger than we had anticipated and to make matters worse, in order to keep the dimensions and proportions of the logo right, the size went up to 30 sqm. We now had so much more work to do and in a shorter time period. The students would be away for exams, on spring break and vacations, so from May to August, it would be just us, a few students and a few volunteers to work on the project. b. I had never worked on such a massive project and one that carried so much responsibility. Since it was related to the Father of the Nation, it was a huge responsibility to see it through and make sure that it turned out well. If not, it could mean extreme criticism and negative publicity, not just for me and my team, but for the whole university. c. I had never ever worked on a portrait / face before; I needed ideas and help from expert quillers. This was difficult as it was to be a confidential project until the day of the event. The students were not experienced enough to work on the face area and no one dared to touch it either. In July, once the work base was ready, I asked to be allowed a friend to help me with this project. The first name that came to mind was Nandini Acharya Rao. Besides being a close friend I could trust, she is also one of the best quillers I know. I have always admired her work, and am so lucky and blessed that she agreed to get on board with me throughout the project. Did you work on the quilled elements at home and then install it on the background at another location? I started paper quilling workshops with the students from 12th of February 2018, and then with the help of volunteers and my earlier students, we went on giving quilling workshops. We taught basic shapes and as their skills improved they helped to quill the elements and designs. We worked endlessly at home, at the hostels, and the university. 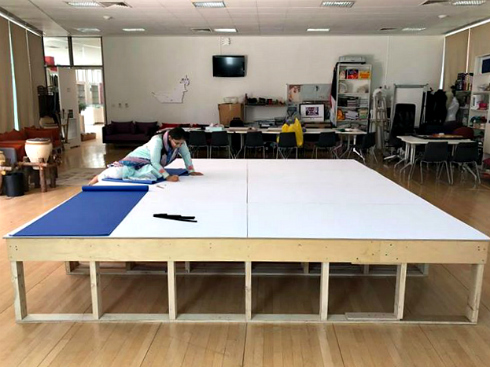 Our main board was located at the university so all of the assembling was done there. For the face, each individual element was made only by Nandini and me. We made some at home and some then and there as per requirement. Meanwhile, the students were making elements for the rest of the board. 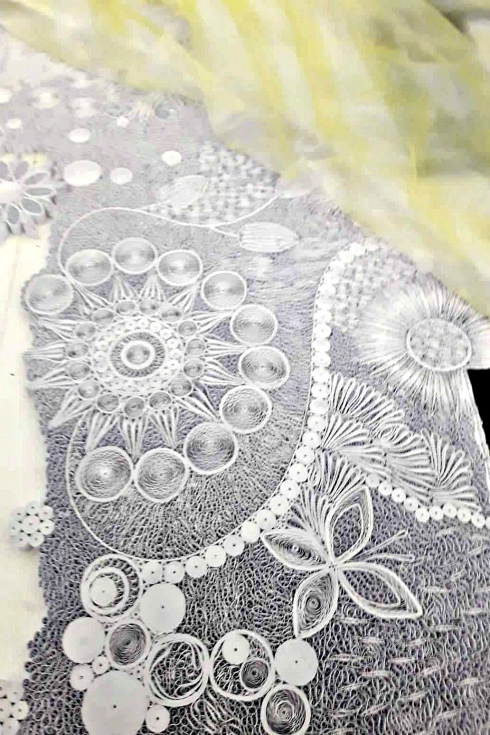 It looks as if the individually quilled shapes are typically tiny… each made with just several inches of narrow strips of paper, yet because the finished project is so large, are they actually much larger? The individually quilled shapes are really tiny and finely done. 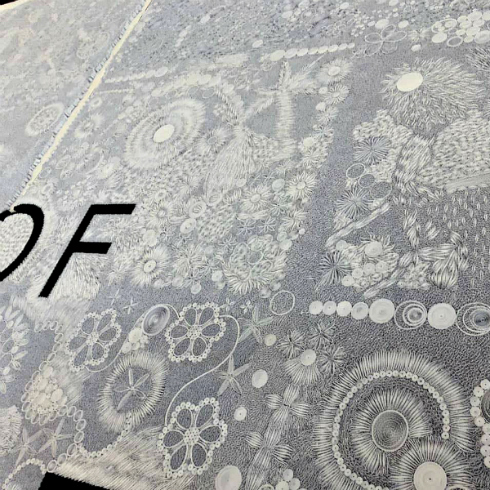 The white background designs were created by the students... some are lace-like, some are butterflies, palm trees, mandalas, etc. I told them to play around with the techniques they had learned and make me proud. It feels so wonderful to have taught paper quilling to more than 500 students and many volunteers, and to see them create such beautiful work. And you managed to complete it on time? It took about seven months of actual quilling. I was quilling at work, at home, during the commute to and from work, weekends and long drives, etc. But the rest of the planning, carpentry, and brainstorming had started in November 2017. What will happen to the mosaic now that it has been unveiled? 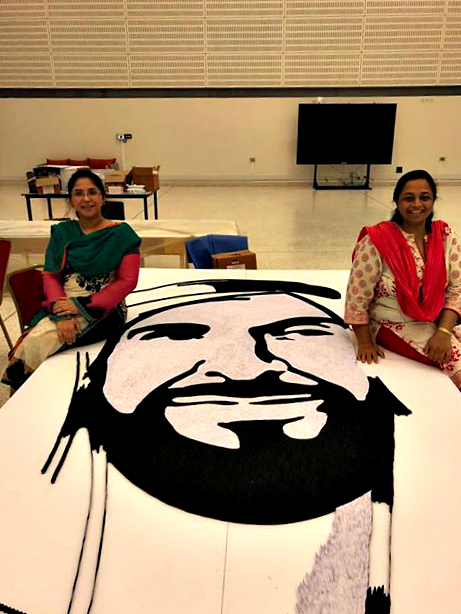 For now the art work is on display at the UAE University, Al Ain. I hope it will be displayed at a much bigger platform like a museum or art gallery where more people will get a chance to see it. This last question is one I normally would have started with, but tell us about your personal introduction to quilling.... other quillers are always curious about that. I have been crafting for ages and into different crafts like crochet, knitting, kanzashi, plastic canvas, embroidery, sculpture painting, clay flowers, fabric painting, punch craft, etc. I came across paper quilling for first time seven years back, during a craft fair where I had a table with my various crafts. 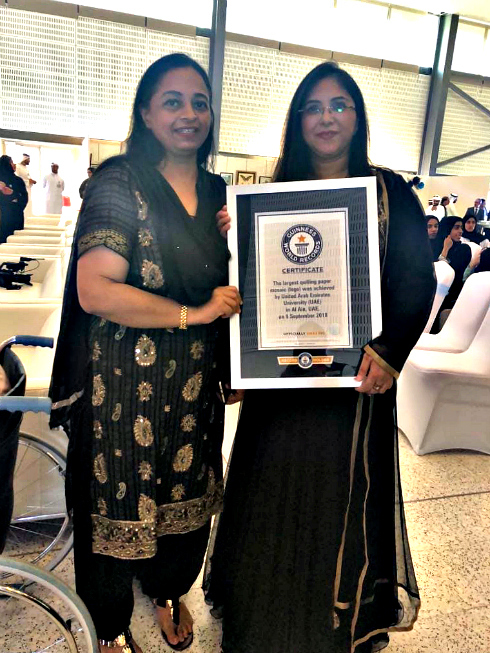 The table next to me had tiny dolls quilled by Amna Al Fardh, who is the recipient of two Guinness World Records for creating three-dimensional quilled dolls. 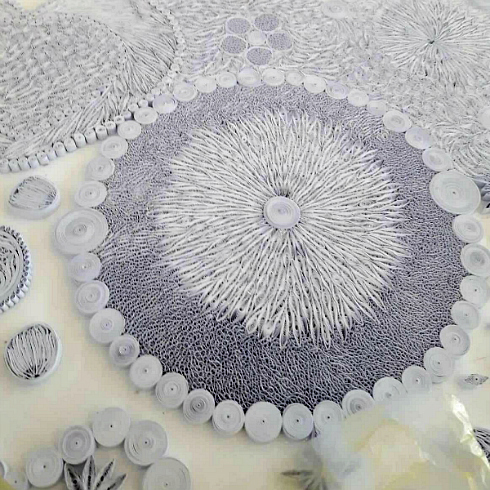 I was so mesmerized by her beautiful work that I was inspired to start quilling myself. Amna introduced me to basic techniques and was very encouraging throughout my quilling journey. I bought a few quilling books and using limited supplies (initially I cut my own strips with a paper shredder), I tried out various methods and techniques until I got them right. Yasmin blogs and is on Instagram and Facebook. Wow....that's amazing and beautiful..thanks for sharing. My pleasure, cate, thanks for your comment! What a staggering achievement! Very impressive not just in scale, but in undertaking the huge expectations. I think any project after this will be a breeze! Big applause!